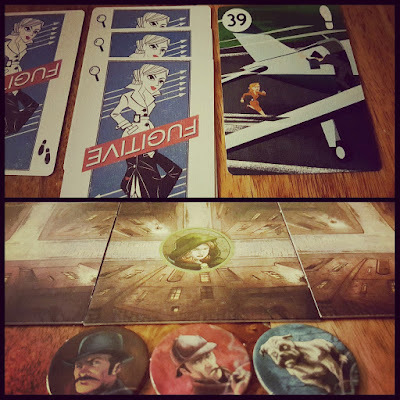 Escape: The Curse Of The Temple - Always a crowd pleaser so I decided to pull this out when playing with three players fairly new to board games beyond Monopoly and Cranium. Not only was it a hit, but we actually managed to win on our second play (which for those who haven't played is a decent achievement), and definitely boosted morale for the night! Did pick up on a few minor rule 'misinterpretations' while we were playing, but to be honest I didn't care so much as everyone got really into the zone while dice rolling through the temple. The soundtrack is often what hooks people, and when those gongs start chiming the pressure is on! Definitely some intense fun to be had playing Escape. Codenames - We followed our Escaping with a few rounds of Codenames. For some reason it wasn't my night and I struggled to connect with my team giving us an overall loss after 3 rounds. I take full responsibility for some dud clues but still as always Codenames is an easy one to explain, play and everyone always thinks they can do better. I on the other hand knew my limit and decided to quit before we really embarrassed ourselves! Incan Gold - The last game we played on the same night as the previous two, and once again I wasn't playing well. Two games of Incan Gold and I ended up with no gems in my tent on not one but two games. Yes, I push my luck too much, but once you lose a few rounds it feels like you need to come up with a big one to get back in the game. Just had some poor luck, but again it didn't matter as its just nice introducing a few new games to some people I don't normally play games with. All three games we played were enjoyed by everyone and they struggled picking a favourite (all three got votes..) so I'd say it was a successful night all around. Time Stories: The Marcy Case - Our first run through of The Marcy Case didn't go well for two reasons. First, we lost. It's expected, but I felt like we made some really good progress through this story and unless there's a few twists to come, it actually feels like we've got a decent chance of winning on our next try. But the main reason it didn't go as good as I had hoped was the fact that I introduced a new player to the game who really didn't enjoy it. It's bound to happen sometimes, but generally I've been lucky matching games to the people I'm playing with but in this case I totally misjudged incorrectly. I tried the whole game to get them involved, making decisions, reading the text etc but it was doomed from the start and was a bit of a fail. Regardless the three of us who played through Asylum had a good time. My first thoughts (which I don't think is a spoiler) is that The Marcy Case is a good follow up in the Time Stories world, but its not as unique or original in the story. There also seems to be a lack of puzzles and it played out fairly straight forward. More action, less thinking, but still a good time. Hope to beat it this coming week! Mr Jack Pocket - The jury is still out on the pocket edition of Mr Jack. The way it plays tends to lead itself towards being more of a puzzle than a game. That's great for some I'm sure, but my thoughts are still a bit mixed. I'll have to play it a few more times to get a better gauge on things but it seems a bit easier to win as Mr Jack, and once you figure out the formula for the puzzle it makes it pretty tough for the inspector to win. In a way that is a bit of a positive as it's got me more excited to play the inspector and come up with a plan/strategy to counter what we keep doing as Mr Jack. Fugitive - I didn't mention it above, but play these two games is a continuation of getting my article rating 2 player games in my collection. I think I have 9 - not that many, but 2 player games are very important for a lot of board gamers as they can be the easiest ones to find time and people to play with. Fugitive is sitting pretty high on the list at the moment. Anything can happen, but it just plays well with simple rules that make sense. The style adds to it a bit, but we've gotten past the art and play more with the mechanics mostly forgetting there is a lose story going on in the background. It doesn't matter though as the mechanics of Fugitive are pretty strong. Nothing - And this time it really is nothing - not even a kickstarter! Not sure how long I'll be able to keep this up as it hasn't really had the desired effect of allowing me to play other games, but I'll give it some time just to be sure.